LUXE Hotel Downtown Los Angeles. mediums were our only choices. The Wave of the future is digital content. 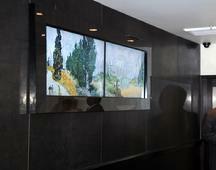 Interactive Art on large screens. Dual screen is 92" wide. Artists works are brought to life after many hours of studio work. Animated works inspired by Van Gogh, Monet, Renoir, Klimnt and others. 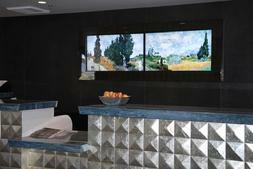 High end Commercial or Residential Installations. for permission to use images or video.